I’m participating today in the Character Assassination Carousel by the very funny Ninja Mom. 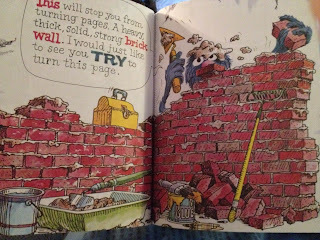 Each month she hosts one of her blogger friends as they place their children’s story of choice in a brand new light...after most likely reading it so many times they can recite it by heart. Previously on the carousel was Farrah at The Three and Under. Take a spin with the list of other contributors who cleverly put some of children's beloved titles and characters to the test. Next in line is Marian at Just Keep Swimming. I can't wait to find out what she has in store for us in July! What book did I choose you might ask? That's right. The carousel is brought to you by the letter M and the number 4. 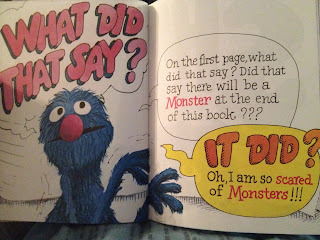 A Sesame Street Golden Book favorite. Hello, everybodeeeee! I have a personal story behind this book before we begin. It includes the reasoning why I rarely pull this sucker off the shelf anymore. Picture it. A new mom with her four-month-old baby boy on the floor. She's cooing and giggling with the baby and then thinks it would be such a sweet moment if she read one of her favorite books from childhood to her son. She grabs the book off the shelf and snuggles in with her little man. 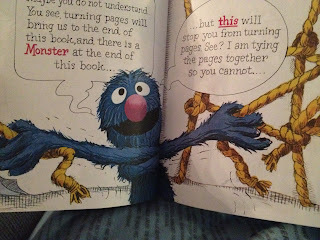 As she begins to read she gets creative and poorly tries to imitate the voice of Grover. Then the baby starts to cry. No, not just cry. WAIL AND TREMBLE. IN FEAR. Reading time is over, Grover. But besides scarring my child with this book, Grover's reactions kick me into "Mommy Mode". All I want to do is soothe him, calm him, scold him, and then put him in time-out for making such a mess. Here. Let me show you. Grover. Chill out, buddy. Don't worry about it. 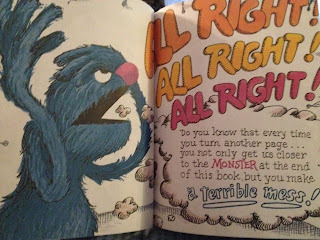 You know you're a monster, right? Crap. 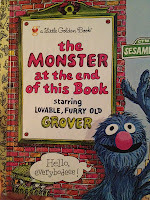 Now I have to give Grover the "Big Bird and the bees" talk. Wait a cotton pickin' second, Grover. I don't have enough time to read 'Fifty Shades of Grey' and now you're telling me I can't read this book either? It will take five minutes max if you just let me turn the pages. Oh for goodness sake. Save the drama for your own mama. I have to get through this book at some point. Just go sit over there on the other side of the room if you don't want to listen. Ear muffs. Grover, honey, I am a mom of a four and six-year-old. Do you think a few ropes are going to slow me down? By the way, where did you get those ropes? If those came from Oscar's "house", we're going to need to Purell your hands. 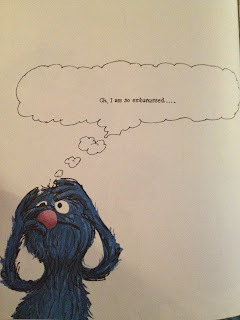 GROVER! Don't lose your sh@#. I'm right here. Nothing is going to happen. I'll be honest, though. I'm a little freaked by the stars shooting out of your mouth. What's next? Pea soup? Again. Where are you getting all these materials to make these things? It's fine because it keeps you from wigging out on me, but let me just giving you a quick warning. If your hammering wakes up the four-year-old from her much needed nap, I'll be the one spitting pea soup. Capisce? I'm sorry. Did you just say that *I* am making a terrible mess? Someone needs to stop and think. Did I take out the ropes? NOPE. NOT ME. Did I take out the hammer, nails, wood, saw horse, and vice? NOPE. NOPE. NOPE. NOPE. AAAAND NOPE! So, let's try this again. WHO is making the mess? Seriously, Grover? Do you know how hard it is to get mortar out of fur? Aww! Really? Me? Strong? 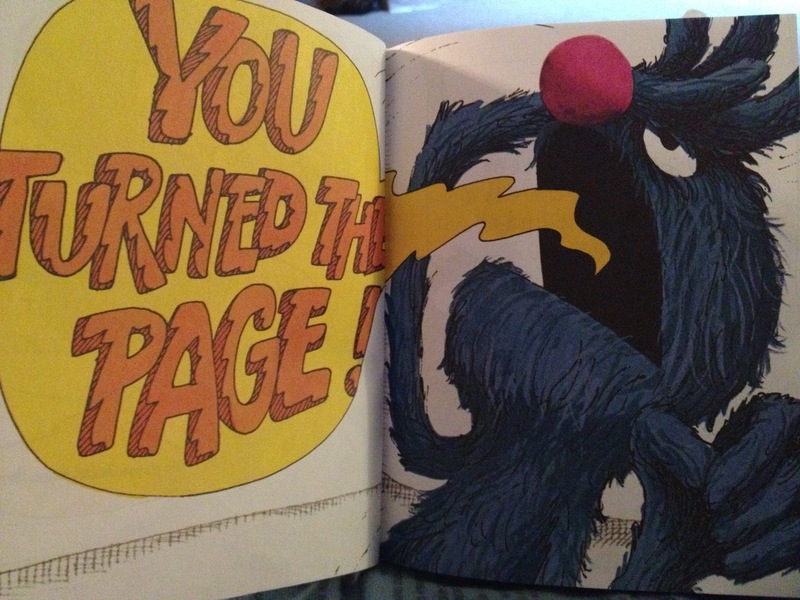 Thanks, Grover. That is nice of you to say. Lately I've just been feeling like I am holding it together by a string, but this made me really feel like I'm doing alright. I'll get the broom and you get the dustpan. If we work together, we can get this cleaned up in no time. Who wants to start us off with the "Clean Up" song? Okay. We've been over this. What kind of monsters do you think you are going to find? Werewolves that take off their shirts and sparkly vampires? In that case, we'd better hurry to the end! TRUST ME! I see what you are doing here. A little reverse psychology. *Someone* has been paying attention. ...you're going to be doing it all over again VERY, VERY soon! This was such a fun and therapeutic writing experience. Well . . . I have only a few things to say. Perfect, concise, witty, winner! I love this. You did a great job with one of my childhood faves. It's hard to pick a best line, but "Ear Muffs" is near the top. Thanks for taking aim and executing with extreme prejudice. Brava! 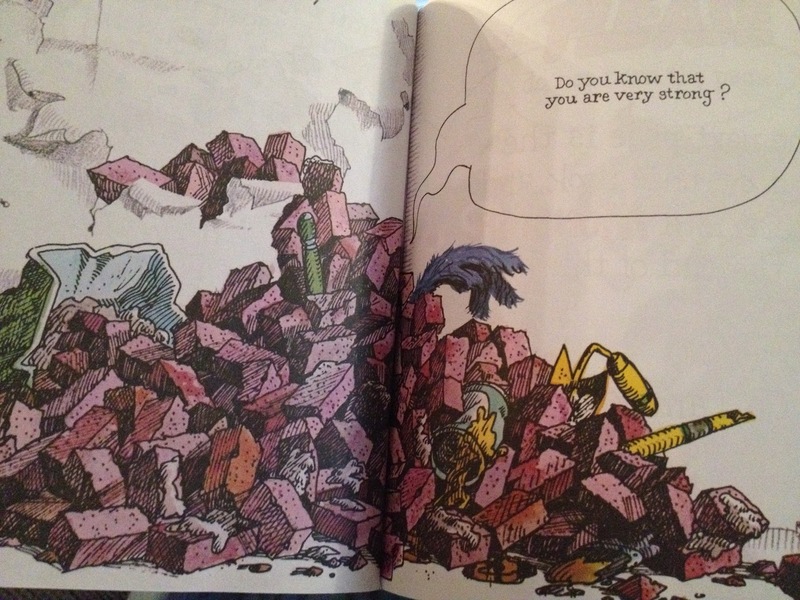 There's something hilarious about ripping up a childhood icon like this. Great job! 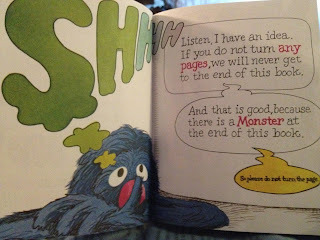 It's as much fun as the book itself! Thanks so much, Guap! I'm glad you liked it! Great job! The copy we have is actually my husband's from when he was a little boy. My 4 year old adores it. That's cool, Heather. My copy is from my childhood as well. That and "Cookie Monster and the Cookie Tree." :) Thanks for reading! 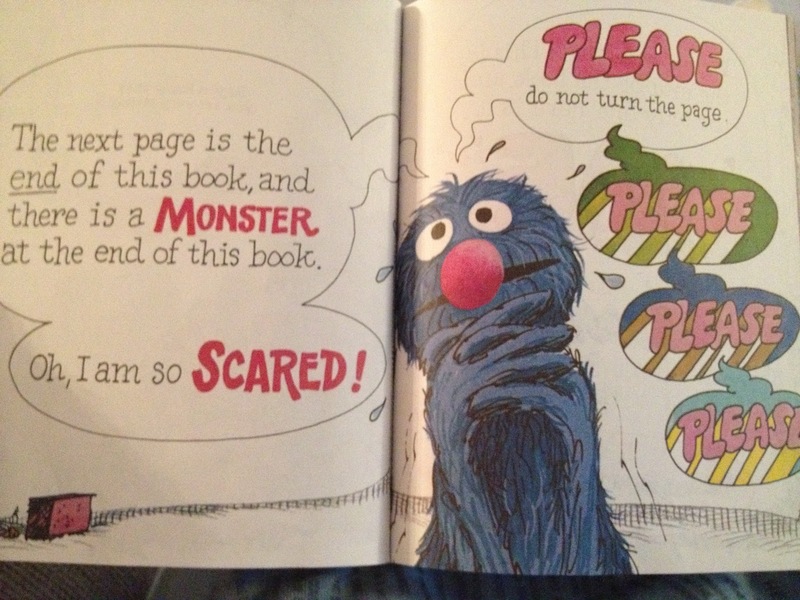 My son was scared of this book when he was 2. Now he loves it but I think I'm going to have to add your commentary from now on! My daughter loves Dora the Explorer. Whenever Dora says, "Where are we going?" I want to yell, "If you were paying attention to what Map was saying you'd know! And stop yelling at me!!!" Haha! It's so true. Backpack says it 3x! Geez. Listen, Dora! Thanks so much! Haha! When I saw you picked this one I was all, "NO WAY! What could anyone not love about this iconic book?!" But you totally nailed it. 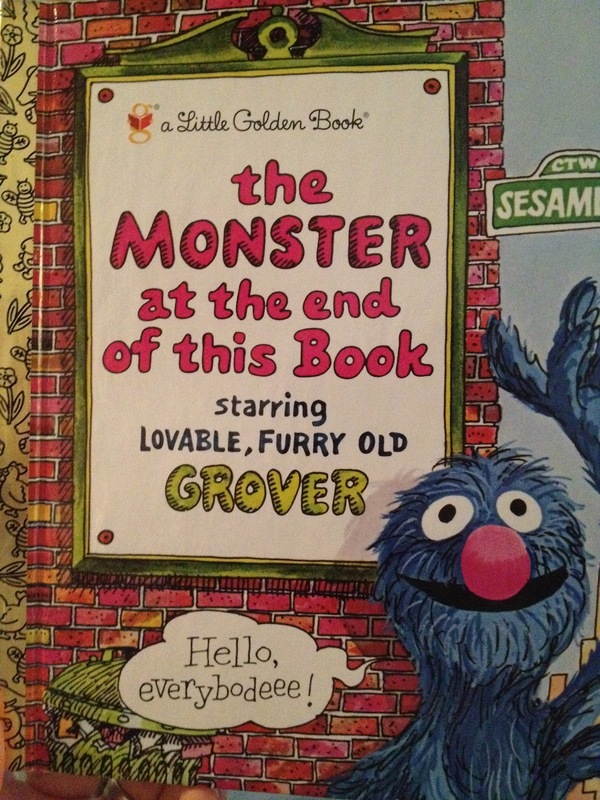 I do love me some Grover, but I always strain my voice reading this book. Ear muffs! Yes please! Thanks so much for stopping by! I loved your take on that Llama. :) Ear muffs all around!! Good one! My voice box hurts just THINKING about trying to do the voice! I completely forgot about this book, but with another baby around I suppose I'll have to dig it out at some point and read it again (and again and again). 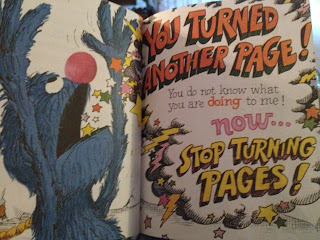 I love what you did with it - and now someone should explore why they keep letting that little twit Elmo into everything to steal Grover's thunder. 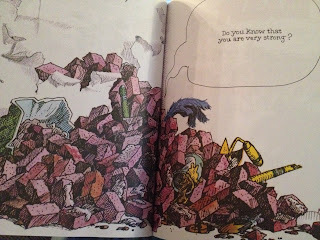 "Big Bird and the bees" talk. Ha Ha Ha! This cracked me up. Nicely executed. Hahahah- oh the theatrics. Nice job! 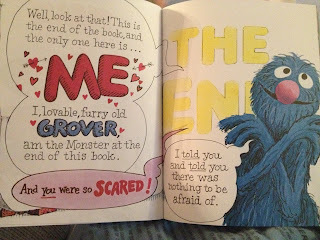 I actually think I read this story way back when-- and Grover really does need to chill! This book is an app on my ipad the the boys listen to nonstop. 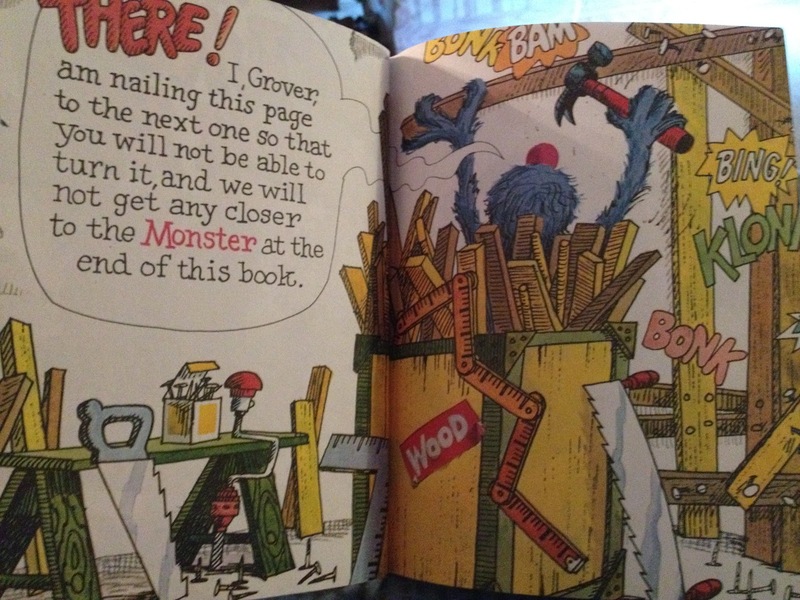 I have to admit though, I have a pretty good Grover voice.